It shames me to admit this now, because I was clearly missing the story of salvation, the entire reason why Christ came into the world. The apostle John counters this notion with parenthetical notes in his Gospel that Jesus knew “all that would happen to him” (18:4) and “that all was now finished” (19:28). What is amazing about this passage is that Christ himself explicitly refers to the psalms as prophecies about the Messiah. As we remember the Lord’s death today, I’d like to point you to one of the most powerful messianic passages in all of Scripture: Psalm 22. As you read the excerpts below, think back to the events of the Crucifixion. Seeing these prophecies so powerfully fulfilled, we ought to be inspired to declare with the centurion, “Truly this was the son of God!” (Matt. 27:54). None of us can come close to fully comprehending the suffering Christ endured, and the wrath of God he bore for us. At the same time, however, Psalm 22 looks forward to deliverance—to Jesus’ resurrection from the dead and our redemption and eternal life. A. Because Christ alone is the eternal, natural Son of God. To further the goal of increasing Psalter Hymnal literacy in parallel with our study of the Catechism, I’ve tried to avoid referring to the same song more than once in this series. In Lord’s Days like this, where Psalms 2 and 72 come to mind almost immediately, keeping to this regimen can be difficult. However, I did discover three unique psalm settings from the Psalter Hymnal that pretty well cover the entirety of these two questions and answers. Sure and faithful, Thou didst make. They shall sit upon his throne. In the fifth stanza, the Psalter Hymnal once again capitalizes the pronouns referring to the Lord’s anointed. The messianic implications here are clear. “We, however, are adopted children of God—adopted by grace through Christ.” The opening words of Psalm 27—“The Lord is my light and my salvation”—are well-known to many, but this psalm also contains a striking emphasis on God as our heavenly Father. The Lord will be my Friend. Nor was my hope deceived. “Not with gold or silver, but with his precious blood, he has set us free from sin and from the tyranny of the devil, and has bought us, body and soul, to be his very own.” Psalm 103 is rich with soteriological truth, portraying God as our merciful Savior, Father, and Lord. All His mercies to proclaim. And His love thy life sustains. He has all our sins removed. It is with words of incredulous awe that Psalm 139 opens. Indeed, this could easily be classified as one of the most personal, even intimate psalms in Scripture. I was first introduced to the rich depths of Psalm 139 in a sermon that Rev. Rich Kuiken of Pompton Plains Reformed Bible Church delivered at West Sayville back in 2010. This was the first exposition of a psalm I had heard in sermon form (or maybe just the first one I was truly paying attention); perhaps it could even be said that this sermon sparked my desire to learn more about the divinely-inspired songbook. In any case, Rev. Kuiken pointed out the basic structure of Psalm 139: the awestruck psalmist David marvels with both head and heart at God’s omniscience, his omnipresence, and his omnipotence. Of God’s transcending knowledge, David says, “Such knowledge is too wonderful for me; it is high; I cannot attain it” (v. 6). Of his limitless presence, the psalmist asks in incredulity, “Where shall I go from your Spirit? Or where shall I flee from your presence?” (v. 7). And, reflecting on the Lord’s marvelous work even in creating his own body, David confesses, “I praise you, for I am fearfully and wonderfully made. Wonderful are your works; my soul knows it very well” (v. 14). This revelation of the Lord’s might serves as a double-edged sword. It affords joy and comfort to the believer, but to the unrepentant it affords little of either. David complains to God of those who “speak against you with malicious intent; your enemies take your name in vain” (v. 20). Righteously he calls upon the Lord to judge the wicked. It must be nearly impossible for any songbook to do justice to Psalm 139. Nevertheless, I believe the Psalter Hymnal does a nearly flawless job. Although the tune of “Just as I Am, without One Plea” may conjure up images of Billy Graham crusades, its heartfelt inflections and connotations are perfectly put to use here. Even the musical climax of the verse, at the end of the third line, coincides with the key words of each stanza. I have no complaints to make against the tune, FEDERAL STREET, except to comment that it seems rather boring and mundane for such a moving text. Personally I am very fond of the tune ST. CRISPIN, which is used with this text in the 1912 Psalter. Below is a recording of a Christian high school choir from Michigan singing “All that I Am” to this tune. Actually, number 289 is one of the most frequently-occurring selections on Reformed YouTube channels. Here are a few more enjoyable recordings (1 2 3). Although number 290 is only a partial versification of Psalm 139, it is a good one. The text is fairly literal, and the tune, BINGHAM, fits it well. I ought to mention, however, that my personal favorites will always be numbers 288 and 289. We’ve spoken in the past about how Christians ought to view psalms of lament and imprecation. Are these sentiments worthy of a believer’s lips? Rev. 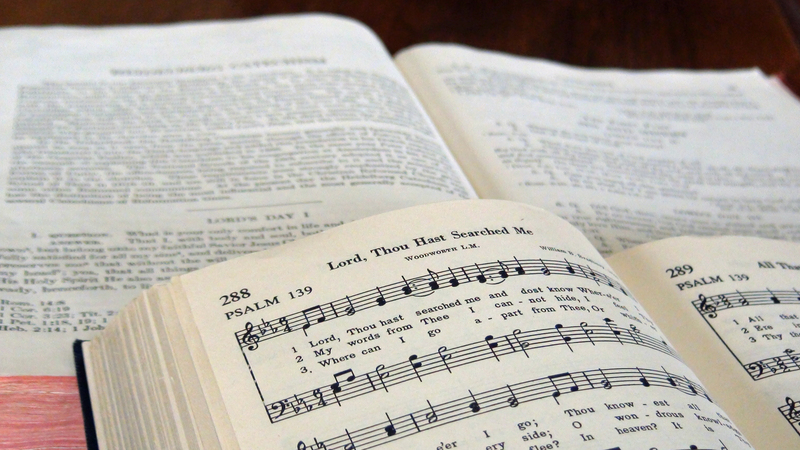 Daniel Kok of Grace URC in Leduc, Alberta, shares his thoughts on this matter, and emphasizes the unique value of the Psalter. A wise elder in a congregation I once served told me that I should select the first song in worship to be a joyful song of praise. His concern was that I, having chosen a sadder song to begin our Sunday worship, would bring to mind and heart the feeling of a funeral service rather than the glad celebration it was meant to be. Thus the tone of the entire service would be ‘off’ from the very beginning. I appreciated his point and, to this day, have striven to follow this ‘rule’ for the order of worship. And clearly there are many appropriate songs to choose that have aided me in doing so. I’ve also developed a greater-than-usual fondness for the many versifications of Psalm 99. I think I first heard Psalter Hymnal 194, “Jehovah Reigns in Majesty,” sung at an RYS convention. This setting is paired with the familiar tune of “I Sing the Mighty Power of God” and preserves the stanza-and-refrain structure of the original text. Recently, I also heard an awe-inspiring recording of the less familiar number 193, “God Jehovah Reigns.” Although this is a challenging Genevan tune, it offers rich rewards to the adventurous congregation. It is possible that I may have this recording uploaded to YouTube within a few weeks. As you read these words, did you try to pair them with a tune in your head? The only tune that matches this meter is NICEA, the majestic tune of Reginald Heber’s renowned hymn “Holy, Holy, Holy.” Indeed, the connection between these two songs is more than a mere musical similarity. As the hymn peals, “Holy, Holy, Holy! Merciful and mighty!” the psalm setting elaborates, “Merciful as mighty, He delights in justice,/For He reigns in uprightness and rules in equity.” Heber writes, “All the saints adore Thee,/Casting down their golden crowns around the glassy sea,” while Psalm 99 exhorts, “Let the nations tremble;/Throned above the cherubim, by all the earth adored,/He is great in Zion…” Not least among the parallels between these two songs is the fact that while the hymn contains a threefold declaration of God’s holiness at the beginning of each stanza, the psalm also states, “Holy is he!” three times. The resemblance was clearly intentional, and, in my opinion, brilliant. Today’s Featured Recording is a rendition of this psalm setting by a Grand Rapids Heritage Reformed congregation. Unfortunately, “God is King Forever” dropped out of the blue Psalter Hymnal, even though it was included in the original red book, and hasn’t been seen in the CRC or URCNA since. I, for one, would be thrilled to see it make a triumphant re-entry into the new URC/OPC Psalter Hymnal. Even if it doesn’t, however, this version of Psalm 99 has still earned a place of honor in my mental library of psalmody.